The history of Shakespeare in the Rogue Valley is one of volunteerism at its finest. There could be no Oregon Shakespeare Festival without hundreds of local residents, and some not so local, who were willing to give hours of effort far beyond any requested or expected. Tudor Guild was an outgrowth of this generous enterprise when, in the early 1950’s, it became evident that time had arrived for an organized attempt to provide more tangible support of theatrical production, meaning money. At this time, Festival arrangements with local restaurants provide scrip with which young actors could obtain food. These thespians had large appetites to support their energies in those summer productions. Some tales of those days were one of desperation, and even outright hunger. It was locally common knowledge that visiting actors were available for any odd jobs that paid. There was just not enough OSF income in box office receipts to provide living wages for them. Grants and donor gifts did not appear until well into the 1970’s. Along with food, there was the problem of housing. Women scoured Ashland for cheap accommodations and met actors and technicians at airport and bus stops in order to help them get settled. Cast-off household items with which to furnish bare rooms and apartments were gathered and distributed. These were all valiant, but inadequate, efforts. Thus, as written in the charter, Tudor Guild was formed in 1952 for “financial and other assistance to worthy actors and actresses who may be in need thereof; by sponsoring benefits, entertainment and similar projects which shall tend to foster and stimulate interest in said Shakespeare Festival..” Dr. Margery Bailey provided the name, Tudor Guild, and served on the first Board of Directors. They started out with a make-shift collapsible booth constructed of scrap lumber. It was set up outside Festival walls. From here they sold handmade articles and items begged from local businesses. Eventually, the booth was moved inside to the back of the Elizabethan Theatre. This was an all-volunteer effort. 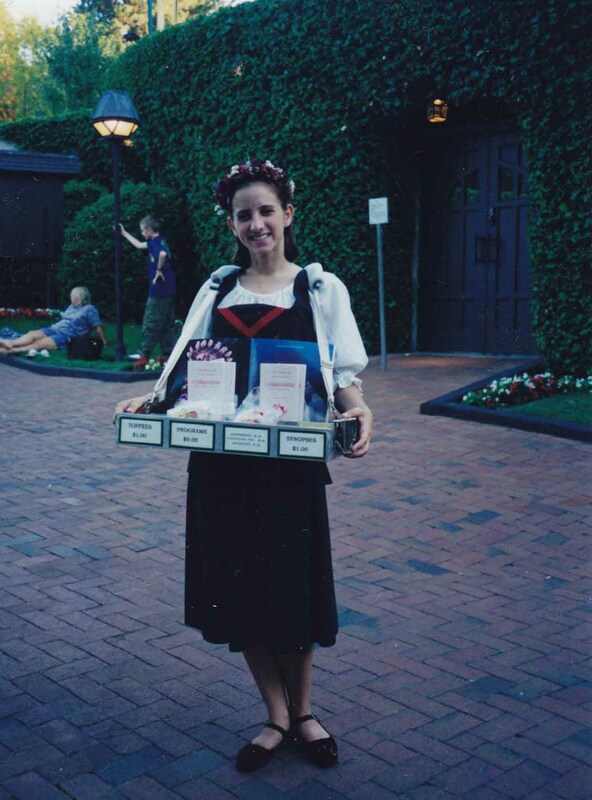 Money was not easy to come by but the 50 (and it was limited to 50 then) Guild members worked hard as they created various money raising events: “Hey Day” celebrations (a type of English country fair held in private Valley gardens), fashion shows, theatre parties and book sales. These funds provided loans to needy company members. 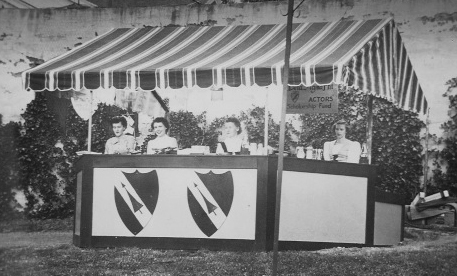 In its first year, Tudor Guild became involved in the Plaza information booth. They sold post cards and other souvenirs. Eventually, they began arranging for visitors’ childcare. For this endeavor, students and mature women were recruited, investigated and trained. Sittings were scheduled by the hundreds, until in 1986, insurance costs determined its end. Aside from fund-raising pursuits, the Guild honed its cooking skills by arranging Casting Night parties for the players after casting lists were posted, and Closing Night dinners at the end of the season. There was also an annual Thank-you coffee for OSF personnel and even a brief three-year stint in the tea room business. Another activity was an on-and-off mail order catalog. By 1963, the OSF program designated Tudor Guild as “the donors of the greatest number of scholarships.” The “scholarships” were given to selected actors and technical personnel in lieu of salaries. They provided only subsistence living. It wasn’t until 1977 that Tudor Guild had a real four-walled room for a gift shop. This was in the basement of Carpenter Hall for two years. At that time, OSF purchased the structure in which the administrative operation now functions. Tudor Guild was invited to move the shop into a mezzanine area of the building. Since then, it has developed into a flourishing business and in 1978, it became necessary to hire a paid, full-time gift shop manager. Along the way, Tudor Guild changed its focus almost exclusively to gift sales. Membership expanded to over 150 volunteers. It still entertains the company with a dinner at the closing of the outdoor theatre and a Holiday open house offering additional shop discounts to the company and Guild members. In November 1997, a new gift shop was built right next door to the previous shop, with the space created uniquely for our retail business and a significantly larger area in which to shop. In case this brief history gives an impression the Tudor Guild saga has been a smooth operation, don’t believe it! It has been a story of ups and downs, optimism and discouragement, good times and not-so-good times, years when the vision was plainly visible and others when it was seen through a fog of uncertainty. In 1995, a Tudor Guild member Janice van Hee chronicled our story in We Didn’t Know It Couldn’t Be Done (still for sale in the shop). Yes, the benefits have been hard-earned but we are assured by OSF that we provide such a valuable service as to make it all worthwhile. Over the years Tudor Guild has contributed more than five million dollars in support of the Oregon Shakespeare Festival.